Published: June 17, 2014 at 07:32 p.m. 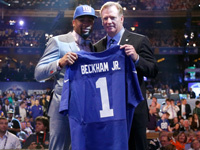 Updated: June 17, 2014 at 07:51 p.m.
Dan Hanzus has another candidate for his list of offseason tropes. Philadelphia Eagles wide receiver Jeremy Maclin is the latest player drawing raves in his return from the previous season's serious injury. Quarterback Nick Foles believes Maclin is better now than he was prior to tearing his ACL last summer. "The way he handled everything last year, he did a great job of it to where he's got even more strength where he can push it even harder," Foles said Tuesday, per Philly Magazine. "I think he is better than he ever was. Throwing to him on the field and seeing him run and catch, I think he looks great." Maclin has gone through 11 offseason practices as a full participant without a setback. "I've done everything since April 21st, when we were able to get out here as a team," Maclin explained, via the Philadelphia Inquirer. "I've been getting better each and every day, and I'm really happy with my progress." Coach Chip Kelly deemed Maclin's recent practice work "fantastic." The five-year veteran hasn't lost a step and insists he's getting in and out of his breaks well. Lining up in DeSean Jackson's old "Z" spot, Maclin will have the opportunity in Kelly's high-octane offense to battle Robert Griffin III, Rob Gronkowski and Julio Jones for the Comeback Player of the Year award.